Today's carrot varieties descended from a wild ancestor, Daucus carota, which provided Europeans with food and medicine since prehistoric times. Other common garden vegetables, like parsnips, resemble carrot plants, and were often misidentified by European scholars during the Middle Ages, according to the World Carrot Museum. Wild plants resembling cultivated carrots are common in the U.S. Some provide edible roots or medicine, but one particular look-alike could be deadly if eaten. Carrots grow a rosette of lacy foliage during their first growing season. Most gardeners don't see carrots in bloom, since the biennial plant sends up a flower stem in its second year. The first year's foliage resembles the leaves of two other garden vegetables -- parsnip and parsley. Parsnip's white root grows to 3 feet in length in good soil, while parsley's foliage provides that plant's only harvest. Daucus carota, the wild ancestor of the domesticated carrot, thrives in many areas of the U.S. and may grow as a look-alike weed in gardens. 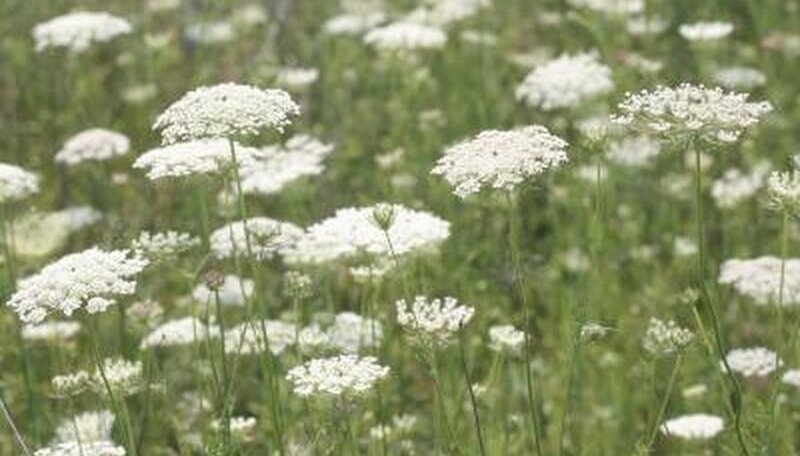 Commonly known as Queen Anne's Lace, the plant draws notice when blooming in large numbers along roadsides and fences. The plant's white root smells and tastes like cultivated carrot but grows to a smaller size. By the second season tough fibers make the root nearly inedible. Yarrow's fine-toothed leaves grow in the same rosette pattern as carrot, and the plant's blooms resemble the white rosettes of wild carrot. Instead of a single flat-topped cluster of tiny flowers, one yarrow plant branches and produces several flower clusters. Yarrow spreads from horizontal rhizomes as well as from fallen seed, and lacks the deep tap root of the carrot plant. Cow parsnip inhabits the same ecological niche as wild carrot but grows in less abundance. This vigorous plant grows 10 feet in height and produces multiple flower heads resembling the blooms of wild or domesticated carrots. The hairy stem of the plant sometimes causes a rash if handled, but the roots contain edible starch and sugar. Cow parsnip provides forage for livestock and wild animals. Foragers might mistake poison hemlock or water hemlock for carrot during its early stages of growth. Foliage and growth patterns resemble carrot, but hemlock soon surpasses the size of the carrot plant and, when flowering, could grow 10 feet tall. The hemlock plant more closely resembles cow parsnip in its mature form and develops a long white tap root. Distinguishing features include a stem with purple blotches and an unpleasant smell from all parts of the plant. Hemlock contains a powerful toxin strong enough to kill livestock and people. Ingesting even a small amount of foliage or root could be fatal, notes the Audubon Society. World Carrot Museum: Carrots -- The Road to Domestication....And the Color Orange!